# 1 – Sad, but true…. “The path to action is not so straightforward at this New Moon, though. Mars – Aries’ ruling planet – is moving toward a rendezvous with Pluto in Capricorn, with this volatile combination in a powerful t-square to the Sun, Mercury, and Jupiter in Libra, and the Moon and Uranus in Aries. It’s no wonder the U.S. presidential election has devolved into an unholy mixture of pissiness and physical intimidation. Half the sky is at war with the other half. # 3 – Lovely image and text from Peace Compassion Love on Facebook…..
Today I breathe out everything I think I should be. 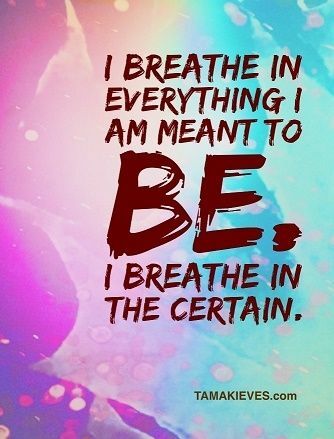 I breathe in everything I am meant to be. I let go of false, invalidating conditioning. I breathe in the certain. My real power comes when I am my real self. Today, I breathe out everything I think I should be. I breathe in everything I am. # 5 – Check out Evolution Made Easier’s What’s New page for information about upcoming free events, free e-books on essential oils, DIY recipes, exercise and more, exciting new software for reprogramming your subconscious, plus other news…. # 6 – And a good reminder from Abraham….. Thanks for the nice comment and wishes for a joy-filled weekend. Same to you, too. It’s bright and sunny here, so I am getting ready to go outside and enjoy the nice weather while it is here. Hopefully you’ll have some sunshine tomorrow, although I sort of envy the rain…..we could use some here.